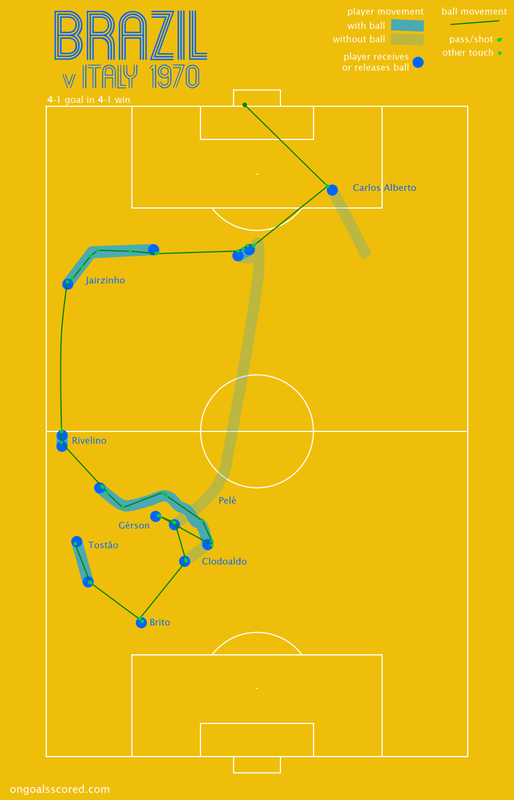 Here’s a diagrammatic celebration of three great team goals, all of which were scored at World Cups. I’ve picked one undisputed classic, one modern great and one personal favourite of mine. They also fall neatly into three categories in terms of type of team goal that they are: the classic is an effortless move of varying pace, my personal choice is a rapid counter-attack and the most recent example involves very gradually passing the opposition to death. As my magic millimetre-accurate goal-analyser is in the shop, I’ve gathered player and ball positions by simply watching footage of the goals with my squishy, fallible eyes. You can click on each image to see it bigger in a new tab. First is Carlos Alberto’s goal against Italy in the 1970 final. I have to admit that I was unable to identify with 100% confidence the Brazilian player that received the ball from Tostão and passed it to Clodoaldo. Most sources say it was Brito (who I’ve plumped for in my image) but there are others that say it was Wilson Piazza. I can’t find a clip from an angle that shows the shirt number and my familiarity with the players in question isn’t nearly good enough to recognise the face given the quality of the footage. I’d be very grateful if anyone can find a definitive answer. 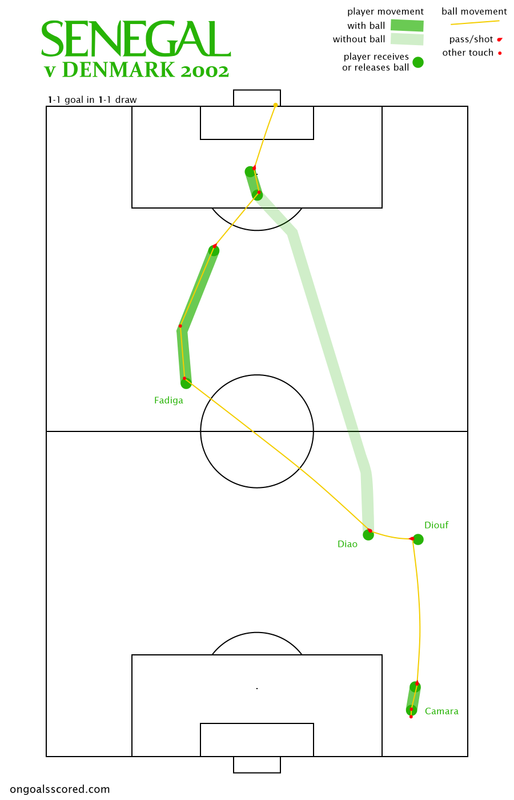 Next is Senegal’s Salif Diao’s equaliser against Denmark in the group stage in 2002. Last is Esteban Cambiasso’s goal for Argentina in their 6-0 victory over Serbia and Montenegro in the group stage in 2006. 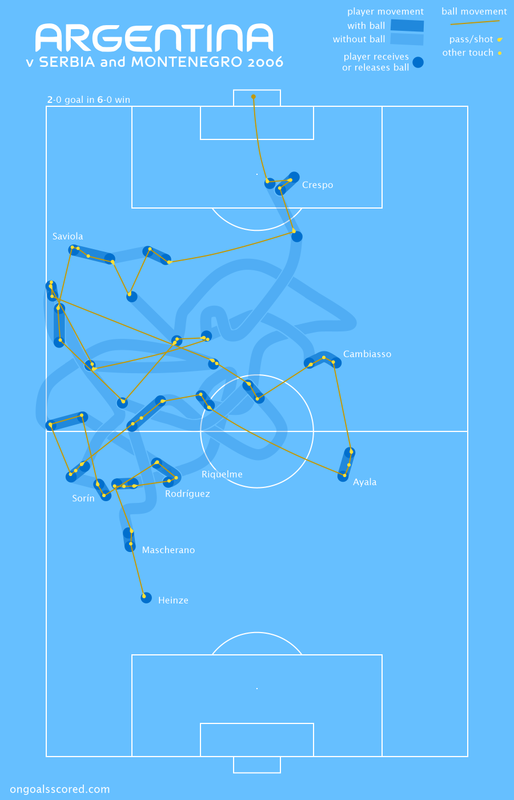 The basics of this goal have been put into diagram form before, in the Guardian (via City of Sound) and in an image posted on Mundo Albiceleste. Got any favourite goals that you’d like to see given this treatment? Your blog is mind blowing. The way the graphics are presented is truly unique and highly creative! Someone essentially lend a hand to make seriously posts I might state. This is the first time I frequented your web page and up to now? I amazed with the research you made to create this particular publish incredible. Fantastic process!